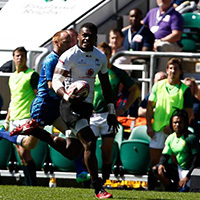 Official Website of Fiji Rugby Union » Personal Development Program to help local players. Personal Development Program to help local players. Home > Newsroom > Personal Development Program to help local players. Established in 2013, the Pacific Rugby Players Association acts as a voice for male and female national representatives of Fiji, Samoa, Tonga, and Cook Islands, as well as the many Pacific Island professional rugby players worldwide. Focusing on building a bright outlook that is not solely focussed on rugby for their players, the Association established a Personal Development Program to ensure that both current and former players contribute to the success of Pacific Island Rugby both on and off the field. 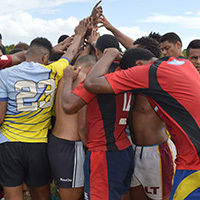 Program Coordinator Gaylene Finekaso said that the purpose of the PRPA is to educate, support and empower rugby players male and female in 15s or 7s. The first session held for 2019 was with the Fiji based Fiji Airways Flying Fijians (Mosese Voka, Frank Lomani, Mesu Dolokoto, Ratu Veremalua Vugakoto, Eroni Mawi) and focussed on networking and personal presentation in group and corporate situations. Fiji Airways Fijian Drua Captain Mosese Voka said the session was an excellent opportunity to develop interpersonal skills that will add value to their lives as men and professionals. 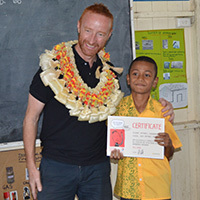 “The workshop today was really good, we worked through improving our confidence in sponsor and corporate situations, where we can hold ourselves professionally and make the most of the networking opportunities we are presented with, rather than shy away which is traditionally the Fijian way” he said. It is a common belief that any engaged, organized and well balanced person will be a better contributor to the game on and off the field. There has been many cases regarding many Pacific rugby players subjected to various dilemmas during their contracts overseas, be it social, financial, performance related or other, many don’t have the skills to appropriately managed such issues so they do not affect their contract or life as a whole. In response to this problem, the PRPA launched their Personal Development Program to empower players with the knowledge on how to perform in any given situation, to thrive in the environment they’re in. The program is modeled on 6 pillars including finance, career and education, faith and family, professional rugby, health and wellbeing and personal skills. Players go through consultations from professional on these different platforms where they come in and provide information to players which will help them with critical thinking and decision making. Flying Fijian Mesulame Dolokoto who is part of the program explained that when they’re on the field they learn about game strategies and on field techniques and the programme works on providing strategy on and off field, “what we learn of the field that will help us in every possible way” hesaid. Finekaso added that when players get into the program they are much informed leaving them to make the right decision for themselves and their families. The programme then continues to support, guide and assist players in identifying and navigating their individual pathways to success. It also make sure that they are thriving in the environment and becoming better people with better character and being the best version of themselves with and have decent and productive working lives after rugby. “We started in 2016 with some academy boys and it’s a pleasure to notice these same boys thriving today with the likes of Frank Lomani, Eroni Mawi, Tuvere Vugakoto, Filimoni Botitu and Tumeli Derenalagi,” said Finekaso. She added that It helps make them think of the long term on how they can maximize different opportunities. Finekaso thanks the Fiji Rugby Union for the support they provide towards the program in making sure that their players are well informed and developed on the field and on their daily life in times to come keeping them secured.